Olivia graduated in 2015 with a BSc in Dental Hygiene and Therapy from The University of Birmingham, where she gained invaluable experience treating a range of patients in a variety of dental environments. After university she secured a place on the West Midlands Foundation Training for Dental Therapists 2015/2016. 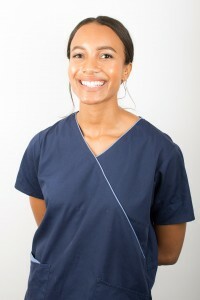 During this time Olivia was published in the British Association of Dental Therapists journal for an article she wrote on her early experiences as a Dental Therapist. Voluntarily, Olivia has been the coordinator for a Public Health England pilot promoting dementia friendly dental practices and has also provided periodic oral health advice to the homeless community, who are otherwise unable to access mainstream services. Olivia is extremely committed to helping people maintain their oral health by preventing and treating dental disease. She joined the team at Scott Arms in 2017 and works on Saturday mornings and until late on a Tuesday to accommodate your schedule. Outside of dentistry Olivia enjoys travelling the world, spending time with friends and family, as well as her cats!